Last Friday and again yesterday, the Vice Chairman of the Federal Reserve, Stanley Fischer, delivered speeches that attempted to refocus his audience away from the systemic global risk posed by behemoth Wall Street banks and redirect their gaze to dangers lurking in the nonbank sector: things like mutual funds and hedge funds. Reading the speeches, we had an epiphany here at Wall Street On Parade: if something does blow up in the nonbank sector it is highly likely to be caused by an interaction with a Wall Street bank. The insurance company, AIG, would not have failed during the last financial crisis had it not agreed to engage in Credit Default Swaps (CDS) with Wall Street mega banks. Fannie Mae and Freddie Mac would not have failed had they not been seduced into buying dodgy mortgages, mortgage-backed securities, and derivatives from Wall Street banks. The Reserve Primary Fund, a money market fund that infamously broke the buck (its shares fell below the sacrosanct $1 per share) in September 2008, did so because of its holdings of Lehman Brothers’ debt – a large Wall Street investment bank which failed in September 2008 while owning two FDIC-insured banks — Lehman Brothers Bank, FSB and Lehman Brothers Commercial Bank. Fischer’s efforts to redirect the debate away from the largest Wall Street banks comes on the heels of a February report from the Office of Financial Research, a unit of the U.S. Treasury, showing systemic problems bubbling again at the mega banks. The study was authored by Meraj Allahrakha, Paul Glasserman, and H. Peyton Young, and found that five U.S. banks had high contagion risk values — Citigroup, JPMorgan, Morgan Stanley, Bank of America, and Goldman Sachs. While Fischer was worrying about leverage at hedge funds in his speech last Friday, the reality is that hedge funds hold billions in assets while the systemic Wall Street banks hold trillions. And it is the same Wall Street banks that are deciding how much to extend in loans to the hedge funds through their Prime Broker operations. If the hedge funds have too much leverage it’s because Wall Street made it possible. During the leadup to Fischer’s Senate confirmation to serve as Vice Chairman of the Federal Reserve, Wall Street On Parade raised a multitude of questions about his ties to one of the systemic banks, Citigroup, which received the largest taxpayer bailout in the history of banking during the crash of 2008. Altogether, Citigroup received $45 billion in equity infusions, over $300 billion in asset guarantees, and over $2 trillion in secret loans from the Federal Reserve – amounts which only became public after Congressional action and a lawsuit by Bloomberg News. Citigroup would also place $100,000 in the super-secretive Citigroup Employee Fund of Funds I, LP which lists an address in the Cayman Islands. In addition to fronting the investment for Fischer, the “contribution will be enhanced with company-provided two to one leverage,” according to the agreement. By 2004, Fischer was sitting on 188,748 Citigroup stock options according to his SEC filing that year. According to an SEC filing Fischer made on January 20, 2005, he held a total of 84,791 shares of Citigroup stock, worth approximately $4.08 million at the time. Wall Street On Parade was unable to determine just how much Fischer made in profits on the sale of his stock option awards but it is clear he liquidated or exchanged them because they do not show on his 2005 filing. Fischer’s employment agreement contained the same type of clause that was revealed in the Senate confirmation hearing of Jack Lew, a former Citigroup Chief Operating Officer now serving as U.S. Treasury Secretary. If either Lew or Fischer left Citigroup for a high level position in the U.S. government or a regulatory body, the restricted money Citigroup had put away for them would be theirs to keep. 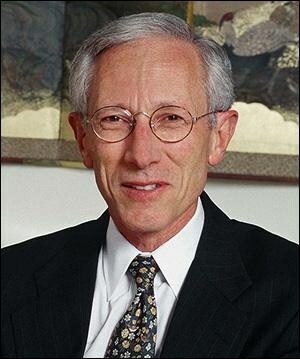 The Federal Reserve didn’t see the last crisis coming and nothing that Stanley Fischer has said in the past week has raised confidence that it has removed its rose-colored glasses when it comes to Wall Street.